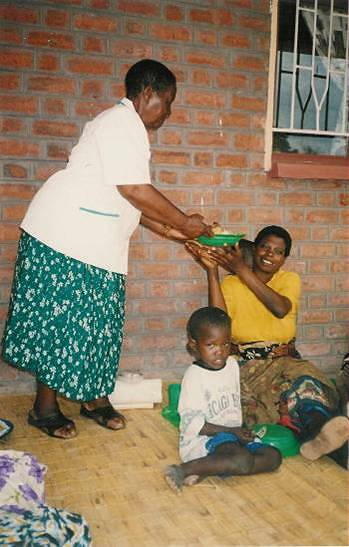 On October 7, 2003, we opened the LifeNets Orphan Care Center in Balaka, Malawi as an adjunct to the Chizeni Clinic that LifeNets helped build. Here's how we got it started. We are very thankful for the food that you have sent to us for orphans. Both we and our children are happy for your kindness. The food is very tasty and the children love it. We are very happy to see the health status of our grandchildren change. They are much fatter now than before. Please do not stop sending the food or our grandchildren will die. We sincerely greet you and thank you. We are your children of Mpulula Village. Thank you! After operating for more that a year this program has been a tremendous success. 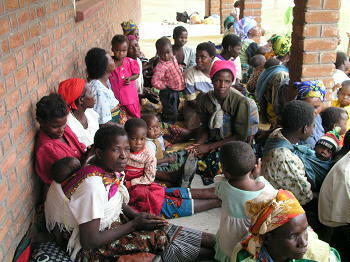 Each week 195 children under the age of five come to the Chizeni Clinic with the guardians from two nearby settlements. 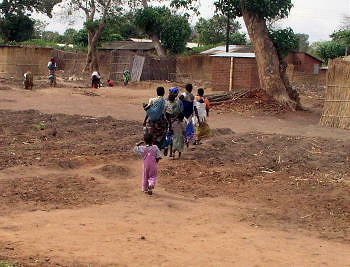 After age five they go to school and care is given there. 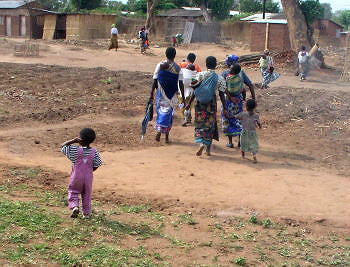 They walk and the the distance of the furthest orphan is two miles. 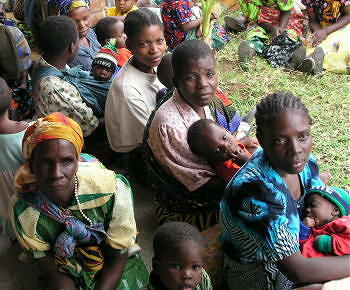 In the village the people eat communally. 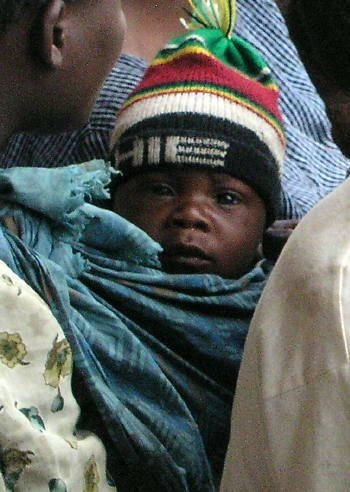 The older children eat faster often causing the young ones who are small and eat slowly to not get any food at all and they starve. 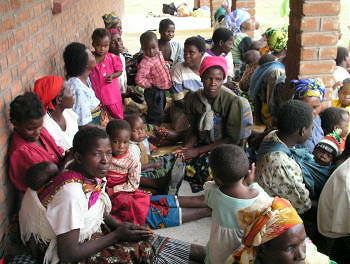 Dr. Chilopora has taken these children for special care as they are the most vulnerable. He has been asked to take on more orphans, but 195 per week is all he is able to handle. 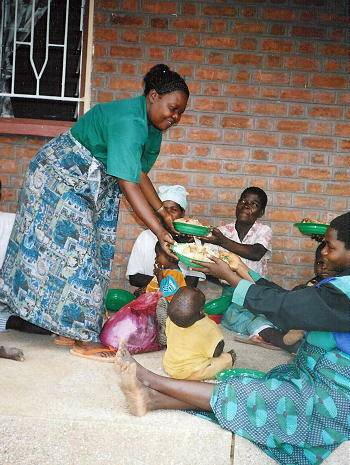 The children are fed a meal and during the rainy season they are given three to four days of food to take back to the settlements. 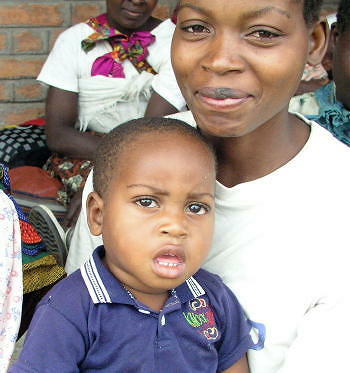 One two year-old by the name of Matilda Fiaei weighed less than eight pounds when they first came to Chizeni. After almost two years she has increased her weight to 32 pounds. Her picture is on the right. She is now (June 2008) eight years old and going to school and her health is fine. Thanks for all who care! The year 2004 started on a positive note. 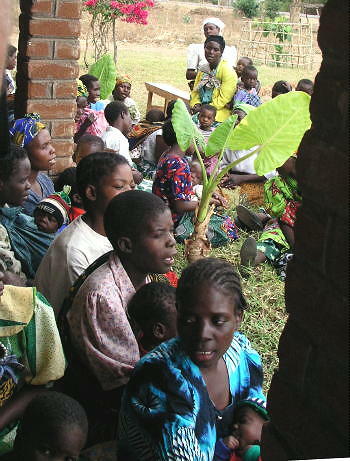 On the first of January LifeNets orphans gathered to celebrate the new year. It all started with a lecture to the guardians on how on how to prevent cholera (we have cases in the district this rainy season) After the lecture some the preparation of meals. 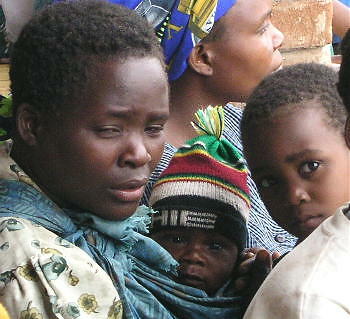 They cooked nsima, rice, vegetables, and meat. 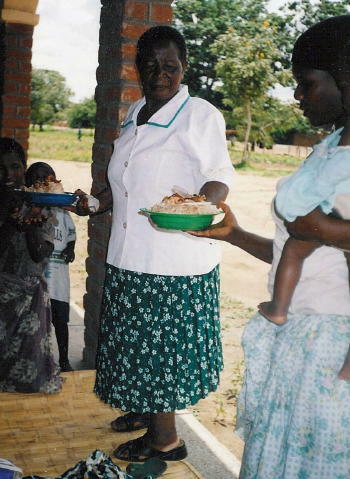 Esther and Gladys did the food distribution. Everybody ate to full satisfaction. The drank fruit juice that was prepared for them. 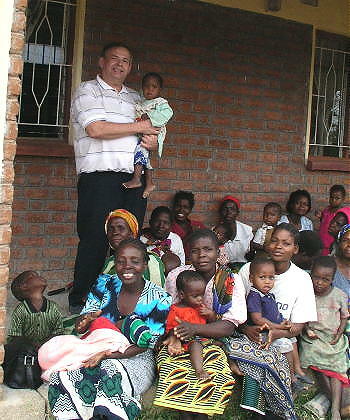 Video taken by UCG Johannesburg, South Africa pastor Bill Jahns on his visit to the Chizeni Clinic in Balaka, Malawi in February 2003. 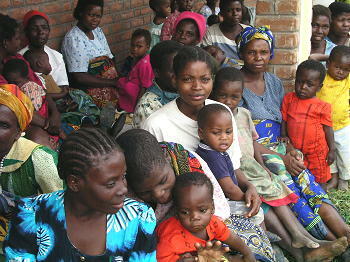 There was singing and dancing as they marched to the front of the clinic. 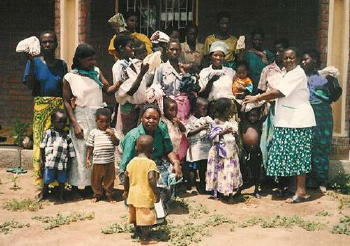 In the afternoon Ester gave the orphans new clothes, assisted by Gladys. 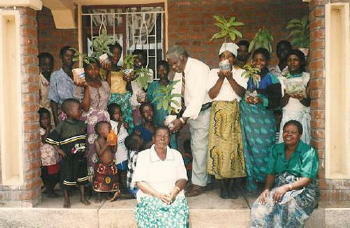 I was involved in the distribution of trees for transplantation in their homes. 35 young avocado tress and more than 100 paw paw young trees were handed out. 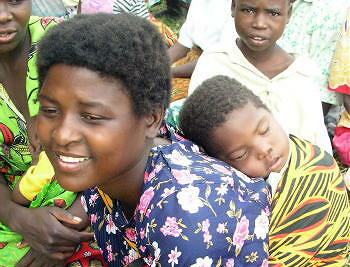 It was indeed a day of rejoicing for LifeNets orphans and their guardians. They were very thankful. The recognized it as a work of God. Thank you very much for your interest a unflinching support. With love, from Sam and Esther. We also spoke by telephone to Sam Chilopora on Friday, June 11, 2004. He commented how they have a severe blanket shortage. As they enter the coldest month of the year that is July, the orphans sleep with no more covering than the only set of clothes they have. He commented how they have been distributing paw paws and ground nuts (peanuts) to the children and how happy they are when then receive them. 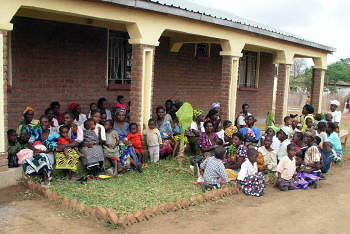 Beverly and I had a moving visit to Chizeni clinic that LifeNets opened last year. 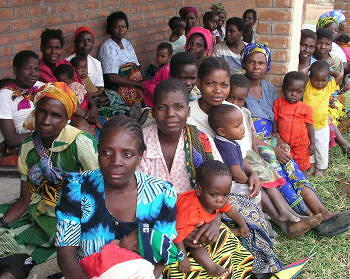 We are so happy with the work that Dr. Sam Chilopora and his wife Esther do in Balaka, Malawi. 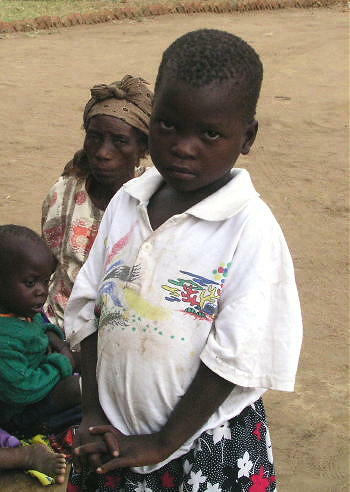 This past year we have provided not only food for the orphans, but we give free medicine. Because of severe need this past year we provided blankets and clothing which was extra for our budget....our supporters always come to our aid and we were able to supply the need. 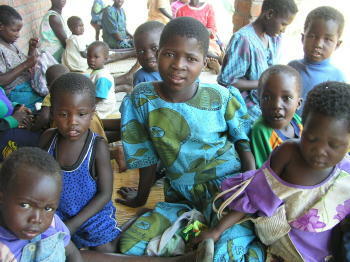 Photos below show the orphans and tell some of our story. 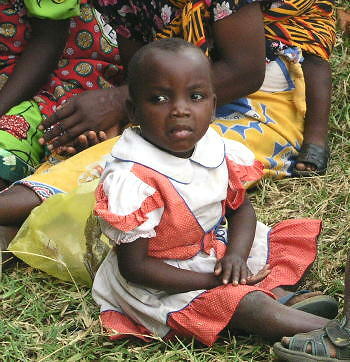 This four year old orphan girl weighed less than eight pounds at age two. She is now healthy and weighs 32 pounds. Time to go back to the neighborhood.